Avila Gardens Celebrates All Mothers! 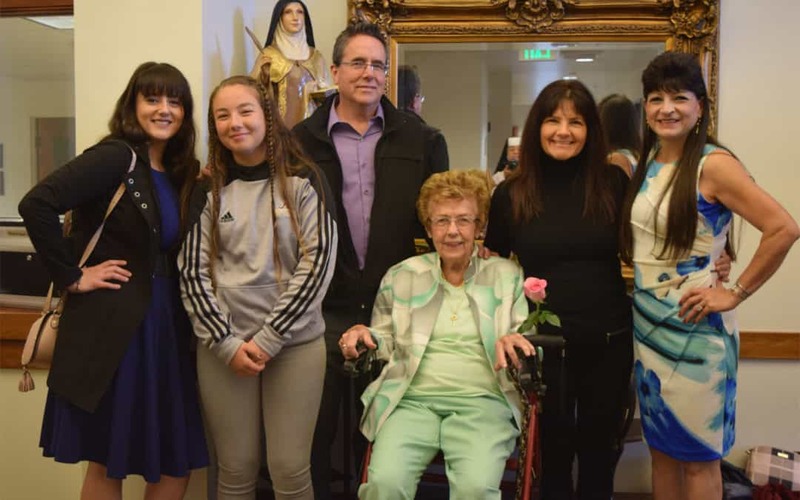 On Sunday, May 13th, Avila Gardens’ Chapel was overflowing with residents and their families coming to celebrate Mother’s Day with a beautiful mass, rosary, Marian procession and May crowning to honor our Heavenly Mother, the Blessed Virgin Mary and all mothers. Residents and their families joyfully processed out of the chapel after mass singing Marian hymns and holding pastel roses that they would soon offer to Our Blessed Mother. The son of Avila Gardens resident, Vera, had the great honor of carrying the statue of Our Blessed Mother during the procession, after which Avila Gardens resident, Lucille, and her son happily crowned Mary with a wreath of beautiful spring flowers. As the Marian hymns floated through the building, each family member filed back into the chapel to offer their flowers to the Blessed Mother. But the celestial celebration did not end there! All stayed to enjoy a delicious brunch prepared and served by Avila Gardens’ chefs, staff and Sisters in our lovely dining room. The warmth of family, friendship and a lot of laughter filled the air amid the delectable aroma of bacon, waffles and other scrumptious food. It was truly a family celebration of the beauty and gift of motherhood and a day blessed abundantly by God through the prayers of His Blessed Mother.